I'm actually prepared this week! I was able to work on my menu ahead of time, figure out what I had in the freezer and base our meals on those ingredients! AND I actually had a lot of time to prepare meals for later in the week on Sunday. Which strangely seems like a rare occurence these days. 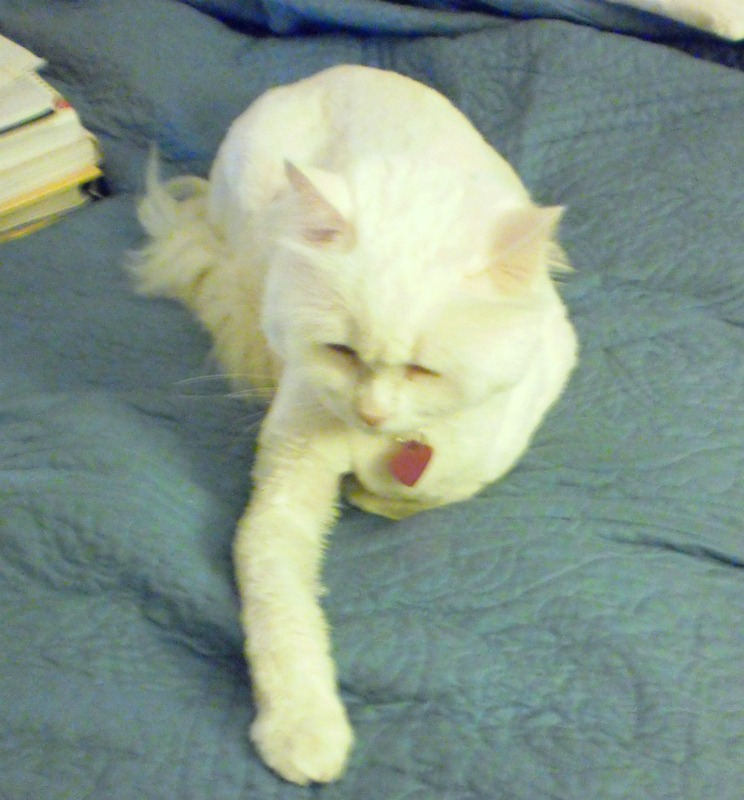 Mitten had a haircut for the summer... now he looks like a poodle! Sunday - Gluten Free Fish Fry with friends, using Baking Beauties GF Beer Battered Fish Recipe (we're using club soda though) with real homemade fries, coleslaw, and baked beans. GF Carrot Cake for dessert! Monday - Creole Black-Eyed Peas & Chicken Hot Pot -- In 1 tbsp. olive oil & 1 tbsp. butter, saute 1 lb. ground chicken with 1/2 chopped onion and 2 stalks chopped celery. Add 1 cup cooked brown rice and 1 (15.5 oz) can black-eyed peas (drained & rinsed) and 1/2 cup of your favorite salsa. Season with 2 teaspoons freshly ground pepper and 1 teaspoon creole seasoning salt. Makes 4-6 large servings. Tuesday - Easy Crockpot Beef Stew -- Place 1-2 lbs. beef shank bones in crockpot and cover with about 6-7 cups water. Add 1 onion, cut in quarters, 3 whole garlic cloves (not bulbs! ), 2 stalks celery roughly chopped, and a handful of baby carrots. Cook on low 6-8 hours -or- on high 4-6 hours. After cooking, take beef shank bones out of the stock, remove meat and add back to stock (toss the bones). Remove cooked veggies from stock & either toss them, or puree them in a blender and return to stock. Add 2-3 freshly chopped potatoes (cut into small cubes), another handful baby carrots, 1 cup frozen peas, and any other veggies & seasonings you would like. Cook on high for 2 hours -or- until veggies are tender. Alllow to cool slightly before serving. Friday - Girl's Night Out!! Probably a funny chick flick at the movies and a gluten free dinner at Outback! Saturday - Homemade Gluten Free Pizza Night!! 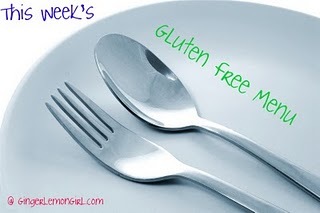 Please visit Heather at Celiac Family to see more gluten free weekly menus! As always, make sure to also stop by I'm an Organizing Junkie to see HUNDREDS of weekly menus of ALL kinds! You are so together this week! Four gym dates, a girlfriend date and your meals ready. I am impressed, especially with your workout schedule. Am wondering why you would use club soda instead of beer? The alcohol cooks completely away and there are some really good non-alcohol beers on the market that can be used to get that yeast taste. Dianna - 1) we don't drink and I didn't want to buy a whole six pack of expensive gluten free beer considering we wouldn't drink it. 2) gluten free beer is hard to find in our area, so it was just easier (and cheaper) to get club soda. Your menu/planning/prep really is paying off! Thanks for posting it all- it is super inspiring. I love that you have a cereal night planned! We do breakfast for dinner often- Love it! You workouts are really inspiring me to be better at planning them in, instead of the hit or miss thing that all too often happens. :) Have a great week, Carrie!